Personally I love when a Summer makeup collection launches during actual SUMMER. There is nothing more discouraging than looking at a bronzer when your cheeks have been whipped by the wind and you have hail stones in your hair. Lancome have released their Summer 2014 collection IN THE ACTUAL SUMMER TIME. I know Mind Blown. Lancome's Star Bronzing range is quite famous - in fact its the first fake cult fake tan range. A few years ago before we have the mass market for fake tanning Lancome had us sorted with a different tanning lotion for every part of the body AND ITS GOOD. 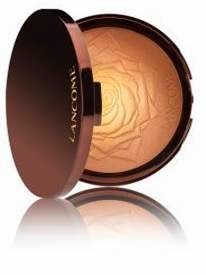 This Summer Lancome have released a special, stunningly pretty bronzer in the shade Golden Riveria (€45.00). Not only is the bronzer stunning - it is embossed with a beautiful flower - its massive and will last you YEARS. The Summer Collection is compact - the bronzer really is the "Star" of the show, it also contains a super soft brush* and a selection of nail polishes. I hadnt tried any of Lancomes Nail Polishes (or Vernis in Love €19.00) and was pleasantly surprised the polish was opaque on the nails after one coat and I was left with shiny vibrant nails. I would recommend a top coat for the polish to last longer on the nails. I have the shade Marine Chic* to show you. Lancome's Summer Collection is out now.